Ruby Reyes and Rafaela Polanco. Activists demand that city’s large non-profits pay their fair share to fund Boston Public Schools. BEJA is currently working on the #FundOurSchools campaign through its PILOT action group and Hub Schools working groups. The PILOT group has been sharing campaign work with partners and working to increase the number of signatures on their PILOT petition. Click here to sign the petition. Hub Schools working group members traveled to the Community Schools Forum in Baltimore, Maryland to learn about implementation of community schools, wraparound services and other ways to add community resources to schools in other cities across the nation. 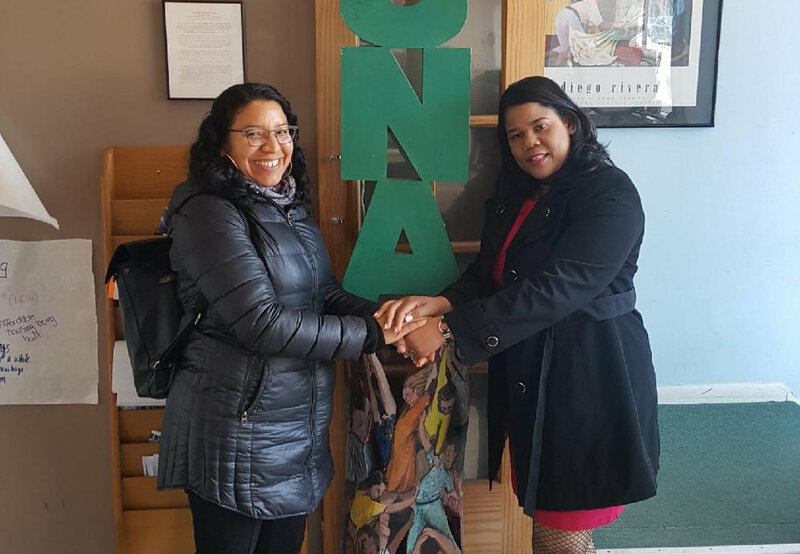 From April 10 to 12, St. Stephen's Church Organizer Rafaela Polanco and BEJA Director Ruby Reyes traveled to Chicago to tour the Parent Mentor program at Logan Square Neighborhood Development Corporation. From there, Rafaela and Ruby then took part in the national AROS convening. Throughout March and April, BEJA parents testified at the series of Boston School Committee hearings and provided testimonies at City Council hearings on BPS budget. BEJA also helped to organize a press conference on the response to the BPS budget announcements, which included harmful cuts to some programs. Parents, students, nurses and school psychologists shared their stories of the impact of the coming budget decisions. Our next BEJA General Meeting will be held on June 5th from 5:30PM to 7:30PM. We are preparing for our June Convening on Saturday, June 16 from 10AM to 4PM. Please join us.